Visiting a coffee farm in Antioquia is an authentic, cultural experience not to missed. 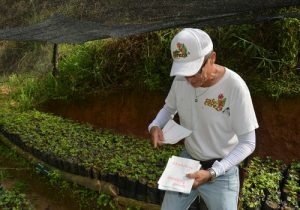 Just 15 minutes from the city of Medellín, your day on coffee farm is interactive and hands-on. Go on walks through the farm’s beautiful creek-side hill. Harvest coffee, and learn the folkloric history of the coffee process from the farmer’s passionate and eccentric coffee grower. Discover why this farm’s coffee holds Colombia’s highest coffee certificate. This trip is a relaxing break in fresh air. With a required fitness level at 1 out of 5, you don’t have to worry about doing anything physically but the ability to walk on the hillside terrain is necessary. Extend your trip with a 1/2 day city tour of Medellín to return to Poblado by 7 pm. In the afternoon, take a ride on the city’s innovative urban renewal project: cable cars from the center of the city to its mountain sides. Visit Parque Arví for a nature preserve and a beautiful view of the city. Enjoy a traditional Antioqueño lunch. Next, visit the fascinating “Casa de la Memoria” museum and end your day with a visit to the indigenous site of Nutibara Hill and the urban renewal project “Pueblito Paisa”. 100% deposit must be made before the trip, for last minute payment and reservation request contact Expedition Colombia. All payment must be done through our booking platform, or via a deposit in our Bancolombia bank account. the other half will be covered by the company.